Remembrance Sunday 2008 will be an incidental activity for most residents of this county; in 1958 it was central. Every adult remembered the war and those of us who were born during the war knew about the austerity that followed it. Our grandparents carried memories of the earlier Great War. Most men in their 30s had seen military service and the military way of doing things influenced many areas of life. Businesses would talk of “military efficiency” as an ideal to strive for. Men’s haircuts were still short and the long hair of the 1960s was a reaction against that. Organizations like TocH, founded during the first world war, still had a presence in the town. Ex-army officers tended to carry their rank into civilian life and were known as Captain or Major or Colonel so-and-so. Even Lord Hesketh, one of the local grandees, preferred to be known as Major Hesketh. This is not to suggest that the miltary dominated people’s lives; obviously everyone got on with life. But it was there in the background. In the week before Remembrance Day past wars came into full focus. The poppy appeal was very big. Every workplace, school and street corner was organized to raise money. In the week before Poppy Day we were expected to take our pennies for the collection. For sixpence or a shilling you could get to sport a larger poppy. I remember one incident from 1953 when one of my classmates was given a huge poppy with multiple petals and leaves for a penny! All morning he was hugely chuffed with his good fortune until it came to dinner time and all he could find in his pocket was a penny where there shold have been a half-crown. As I was in the church choir in the early 50s I became an active participant in Remembrance Sunday. The church service began at 10:30 in a packed church, the we would process along Buckingham Street to the Cenotaph in the Square. The other churches also made similar processions. The Square would then be full of active soldiers in uniform, members of the British Legion wearing their medals, veterans of both wars, the town band, church congregations, leading citizens. At 11 am two minutes of silence would be observed, then possibly a hymn and a benediction before the crowd dispersed. 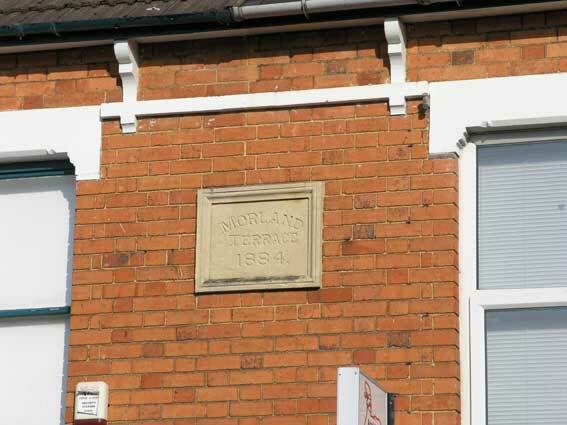 The Radcliffe Street side of the Square was originally called Morland Terrace, and there is still a plaque embedded in the wall to record it as such. the huses here were variously numbered as part of Radcliffe Street or The Square, eventually settling upon the latter. In 1891 the Buckingham Street corner was occupied by a Mr Richard Stapley and his family. He was a draper and outfitter, so from the very first this building was a shop and has continued so to this day. In the 1950s it was occupied by Dudeney and Johnston, Bedford-based grocers with a lot of branches in the region. These were pre-supermarket days, but chain grocers like Dudeneys and Sainsburys were able to offer a better selection of product, often at a better price, than the local, corner-shop style grocer. I suppose there were quite a lot of Dudeney & Johnston-style grocery chains across the country in those days. J. Sainsbury’s was merely one of many, but they had a London base and were obviously able to parlay that advantage into today’s supermarket. Even so, that transition took 40 years. The other residents of Morland terrace were (in order north to south) Walter J Biddis, a foreman coach builder, and family; Henry Gamble, a coach painter, with his wife and brother-in-law, a music teacher; James Carter, iron trimmer, and family; William Purslow, manager of the carriage works, and family; Allan Mills, coach trimmer; Robert Dakin, coach body maker, and wife; Edwin Wood, Foreman, Fitting dept. and family; Heber Williams, Secretary carriage dept. and captain 1st Bucks RVC, and family; Walter Scott, Coach Painter, and family; Frederick Mansfield, Railway carriage maker, and family; John Clewett, Coach Body Maker, and William Coop, Blacksmith. The only break in the north-south/east-west grid system of streets in 20th century Wolverton was the so-called Market Square. If there was ever a market held here its existence must have been very brief. There was a covered market hall on Glyn Square, but that burned down and the old school on creed Street became the venue for the Friday market until the Agora complex was constructed from the razing of parts of Church Street and Buckingham Street. The Market Square was (is) bounded by Buckingham and Aylesbury Streets and Radcliffe Street on the east side. The inner quadrangle was dressed up with shrubbery and trees and provided benches for seating. At the south end a cenotaph was installed after the 1914-1918 war and fenced off. The configuration is not much different today except that the orginal cenotaph has been replaced with a polished granite version. Missing also is the old Congregational Church which dominated one side of the square for about 80 years. Addresses at the Square start to appear in the 1891 census. In 1881 there is only Buckingham Street and Aylesbury Street, and of course Radcliffe Street, so I am wondering whether some houses were demolished in Buckingham and Aylesbury Streets to create the Square? Perhaps it was the intention to host the weekly market there. All the streets to the north of the Stratford Road had been demolished. Oxford Street, Cambridge Street and Green lane were developing, so this new square, far from being on the edge of town, was becoming its centre. If it was ever used as a market, its prime was short-lived.